I like sad movies.Â I also like sad songs.Â Maybe itâ€™s the Ben Gibbard in me, but feeling sad always feels more authentic than being happy.Â Thatâ€™s why when you are on a youth group trip, young and unblemished, you watch Remember The Titans and feel moved by their successes and accomplishments.Â Yet as you grow older, your inspirational sports movie tastes move more towards Friday Night Lights with its Explosions In The Sky soundtrack, where you are moved by their failure and the embrace of the things they lack.Â Now thereâ€™s a new sad movie out which takes another look at the human condition and how our dreams always conflict with our responsibilities. Starting this November 4th, now available on DVD from Farfalla Films and Image Entertainment comes a story of love and belonging in the football obsessed Midwest.Â The Good Life is ready to leap out of your television screen and transport you to the dry cold of Nebraska and the empty hope of a longing human heart.Â Bring home this stylistically gifted and ambitious film today! Jason lives in Lincoln, Nebraska, hates college football, works at a gas station and hates his life.Â He lives with his mother in crippling poverty and his father just died.Â He randomly meets a beautiful and mysterious girl who keeps lying to him, yet still gives him the first reason to stay in this town for far too long.Â Her lies continue and he is forced to face his desires for a good life and just where they might end up taking him.Â This film stars a whole host of actors who put in some of their best work in years.Â Christ Klein is the high school quarterback who peaked at 17 and is now 24, angry at his declining life.Â Bill Paxton rarely appears, but when he does itâ€™s some of his best work of all time.Â Patrick Fugit is a delight as the other gas station attendant while Drea De Matteo is heartbreaking as the poor mother who just wants her children to be happy.Â Harry Dean Stanton shows why we know his name with this turn as a theatre owner whose memory is all gone and leaving more each day while Mark Webber makes a name for himself as the main character who years for a better and good life.Â Zooey Deschanel is a treasure.Â Her beauty, acting skills and wonderful voice light up the screen every frame sheâ€™s there. As far as special features go, this film is regrettably thin on them.Â There are some trailers for other films, yet no deeper looks into the making of this film or even some valuable commentary from the actors.Â It is my sincere opinion that independent cinema needs to embrace special features more then they currently do.Â Bonus materials were made for guerilla cinema.Â We want to see how they did what they did, what it was like backstage, what problems there were.Â The intelligent in America are disillusioned with the way big studios work and would gladly welcome a chance to see what movies are really all about. This is an excellent film and that cannot be overstated.Â It is very ambitious, in both the storytelling and some of the cinematic decisions which were made.Â It reminds me of a more subdued, Midwestern Y Tu Mama Tambien.Â The writing makes the film, yet itâ€™s Zooey Deschanel that makes it shine.Â Without her, it would be good, but now itâ€™s magnificent.Â She is an actress whose impact on film will be felt for years. This film is instrumental to living The Good Life. 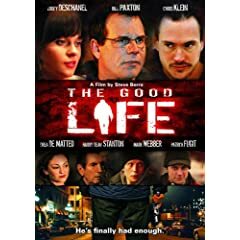 4 users commented in " Movie Review: The Good Life "
I saw this at a film festival in Philly, and it’s every bit as good as the review states. I would highly recommend it, and I can’t wait to get the DVD so I can watch it again. This movie is a worthless piece of s**t! It has zero redeeming features. It never should have been made, let alone released. Just watched this film and it is okay. The main issue is it’s incredibly s-l-o-w. I understand it’s meant to be an ‘arty’ film and not and action flick, but the shots were held so long and the pacing was so slow it started to distract from the story, not add to it. I watched most of the second half at 4x speed and still each scene seemed to go on forever. The ending is a little corny too. But good acting and atmosphere. Pity the editor/director were a little too self indulgent.